Priyanka Gandhi and Rahul Gandhi held a public meeting in Uttar Pradesh's Fatehpur Sikri today. Taking the stage before Rahul Gandhi, Priyanka Gandhi batted for the Congress party. During her speech, Gandhi fumbled but quickly made a save. Talking about the Congress manifesto Gandhi said, "Aisi yojnaein ghoshna patra mein hai jisse aapko swasth sarkari aspatalon mein muft milega" (There are schemes in the manifesto through which you will get free health in government hospitals). 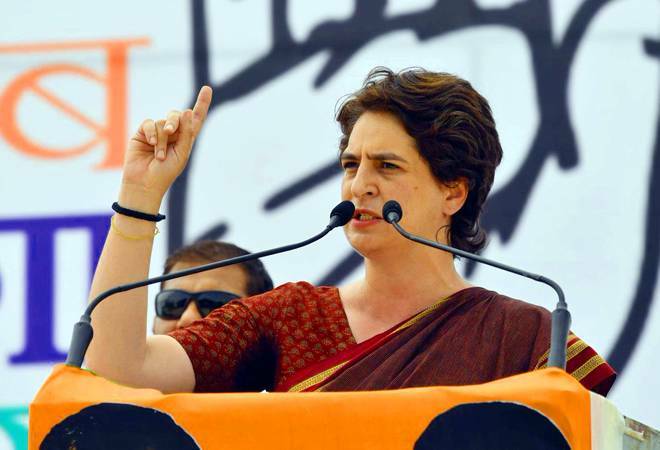 Priyanka Gandhi then continued and said, "Swasth bhi mil jaye toh achcha hain" (It will be great if health can be given for free). Gandhi lashed out at the ruling Bharatiya Janata Party and asked what their agenda for women and women's security is. "BJP is today talking about nationalism and Pakistan. They must talk what they have done for youth, farmers and other sections of society. They must tell what their agenda for women and women security is." She also said that if BJP is nationalist, then they should stop felicitating the ones who have defamed women. Priyanka Gandhi also took a jibe at NaMo TV. "The government's campaigning is so good that they are present everywhere, from TV to trains...in fact, they are campaigning through food packets on polling day," she said. Her brother Rahul Gandhi is infamous for making blunders during his speeches, something the rival parties do not let go easily. With only three days left for Phase 2 of the Lok Sabha Elections 2019, Congress President Rahul Gandhi, UP East General Secretary Priyanka Gandhi Vadra and UP West General Secretary Jyotiraditya Scindia held a public meeting in Fatehpur Sikri today. Scindia is also scheduled to hold a rally in Aligarh.